The field of individual retirement planning is not without its complications and even leading financial advisors have their share of worries when it comes to IRAs (Individual Retirement Accounts). The financial market can be highly volatile and, for this reason, you need to remain at top of your game every step of the way. 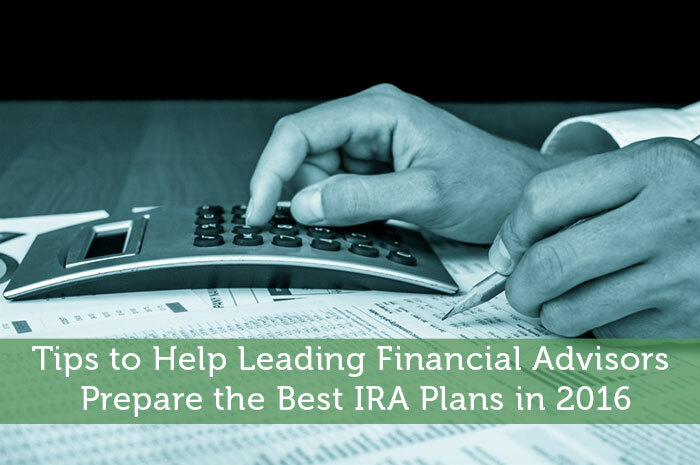 All financiers like to stay updated with the latest trends in retirement savings accounts like the IRA. While you may be set on using traditional methods and devices, the most productive way to achieve better success is to keep abreast with industry developments and trends, and to look for innovative new ways to help your clients save for their golden years. So, what changes can you expect in retirement planning in 2016? How should you prepare yourself to stay ahead of the competition this year? As with any other professional field, knowledge is the key to success in financial planning services. Find out which 401(k) service providers and payroll companies are integrated, to avoid issues when it comes down to implementing a financial plan for your clients. Proper knowledge in this regard can make the entire process simpler and easier. IRA contribution limits have been adjusted for inflation, but given the low inflation levels in 2016, the limits remain the same as last year. With the prevailing contribution limits for Roth, self-directed and traditional IRAs, you have the opportunity to help your clients make better savings this year. That said, you need to keep account of other factors that may affect the contribution limits, such as a reduction in income-based limits. Learn all you can about annual plan reviews to stay afloat in 2016’s financial environment. For instance, unlike traditional IRAs which set a limit on the amount that can be deferred into them, some plans have different limits on contributions, tax benefits and distributions. Many such plans can enhance total contributions by several hundred thousand dollars per year, so your client may be better off updating their savings plan based on changes in income and requirements. Inspire your clients to put emphasis on employee education, especially when they are business owners or companies. Without proper insight and knowledge, it can be tough navigating the IRA market, and employees might end up without a retirement plan that suits their needs. The more informed your clients, the better retirement plans they are able to offer to those working for them. Get a good idea about the competitive landscape. In particular, it is important to keep in mind that Registered Investment Advisors (RIAs) who act as independent fiduciaries have the potential to offer better service than the average advisor/broker. Your worries are a given. You are concerned about how your clients will fare and how this could reflect on you. You want to ensure they make the best decision regarding all aspects of their financial plans, particularly retirement planning. To get the most out of retirement planning, it’s important to set your priorities on the right track. The above tips should help you get a strong handle on your profession and to be prepared for any circumstances that may arise in 2016!